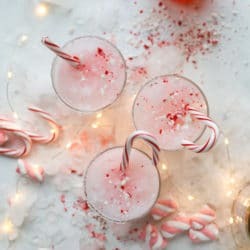 This is theeeee pink peppermint cocktail that you need this holiday season! While I love peppermint, there is something about PINK peppermint that makes it extra special. Right? It can’t be only me. Pink peppermint sounds like a pepperminty marshmallow dream or something. And that’s exactly what this is! Also: EXCELLENT NEWS! I have your perfect holiday cocktail party playlist below. Follow it here! We have candy cane vodka. Homemade vanilla simple syrup. Creme de cacao. A very tiny drop of cream. A candy cane for garnish! I have talked about Tracy’s candy cane vodka for yeeeears. Lacy and I first made this back in 2012 right after she shared it. It is so fun to gift because it’s a gorgeous shade and super easy to make. It doesn’t even have to sit for 24 hours. In fact, DON’T let it sit for 24 hours. Give it 30 minutes and boom, you’re done. So easy and fun. I knew that to make a pink peppermint cocktail, this vodka had to be the base. I wanted something creamy, but not a full-blown cream-based drink (I have such a tough time getting behind a white russian) – and I didn’t want it to be a shake or ice cream or anything. And I really wanted it to be served over (crushed, obvs) ice and go down smooth. YEP. This is what I call pink peppermint cocktail success. Oh and p.s. I’m sure you could also use a drop of coconut or almond creamer in here too and it would work! It may separate a bit, but shake the heck out of it and the first presentation will be super pretty. Hit shuffle on your playlist. Use frosted glasses. Rim with sugar sprinkles or even crushed candy cane. Throw a crushed candy cane on top and give it to all your friends! Now you’re the pink peppermint queeeeen. 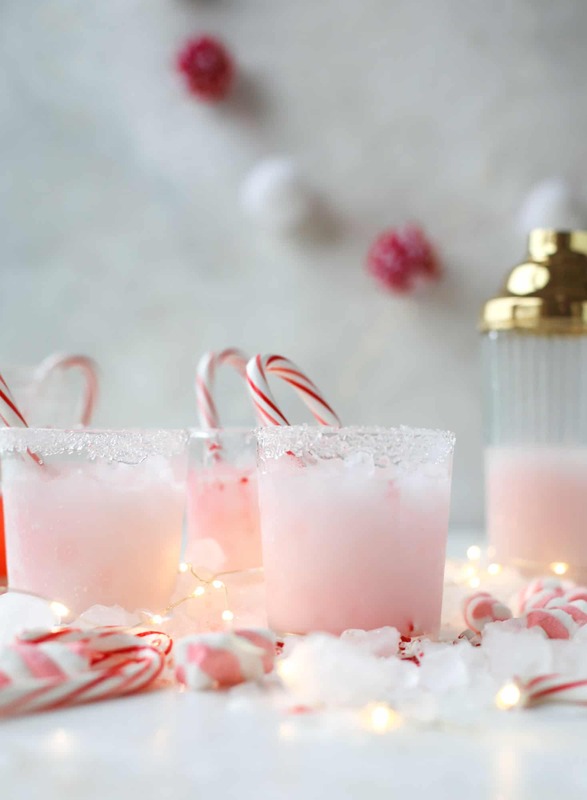 This pink peppermint cocktail is full of holiday cheer! 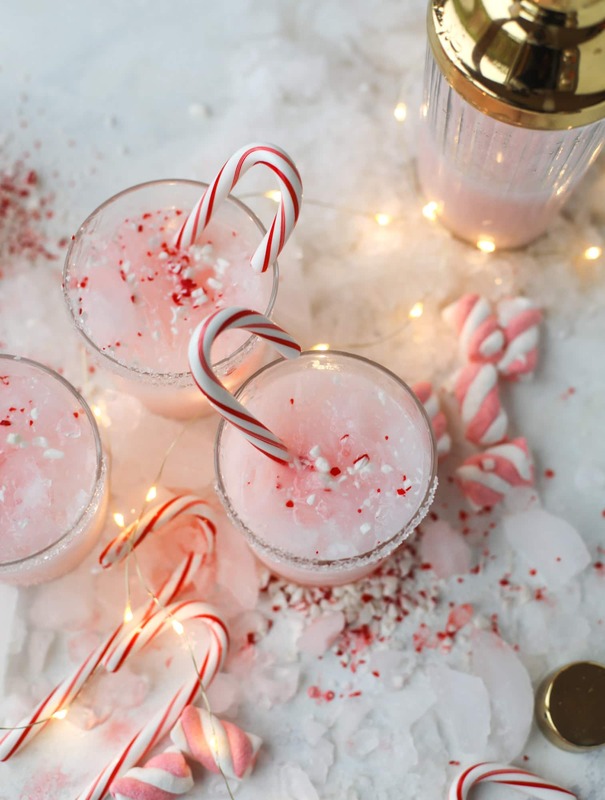 Candy cane vodka, creme de cacao, vanilla and a drop of cream come together to create the perfect iced holiday drink that tastes like a treat! Prepare the candy cane vodka 30 minutes before. Rim a glass with a drop of water and dip it in either sparkling sugar or crushed candy canes. Fill a cocktail shaker with ice. Add the vodka, creme de cacao, syrup and half and half. Shake well for at least 30 seconds. Pour in the glass and garnish with a candy cane! You have got to come back tomorrow for more pink peppermint heaven. This is TOO PRETTY!!! ‘No, sweetie, you can’t have mommy’s pink drink’! Gonna have to make these for girl’s night! I am in AWE! This sounds like Christmas in a glass to me. I love that is just has a touch of cream to smooth it out, and that color is the perfect shade of pink. This is the cutest drink! Thank you for all the hard work you put into your blog! The aesthetics of this cocktail are PERFECTION. Omg. And I can’t wait to see what you have in store for tomorrow! thank you liz!! it’s so fun! Completely agree with the pink peppermint thing! Peppermint just tastes better when it’s pink! :) This is the best! My husband and I are having our annual gingerbread-house-making extravaganza this weekend and this cocktail is so going to be there! I can’t wait!!! so i actually had an eggnog white russian on my editorial calendar for next week (and scrapped it!) – maybe i should do it?! If you love the eggnog lattes there is no chance you won’t love these, my mouth is watering just thinking about one! This sounds fabulous Jess!! 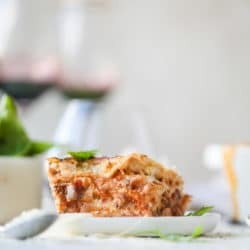 I might try it with egg whites instead of the cream — or maybe in addition to the cream ;) Cheers!! Christmas cocktails playlist is the only thing getting me through the process mapping I am doing right not. Perfect timing! Thank you. for The Pretty Dish e-book!!! And thank you for sharing your family life & your hard work on your blog,howsweetseats!!! Thank you for the heads up on the cookbook yesterday. You made it possible for me to get the book. You mention peppermint schnapps in the post but not the recipe. Should schnapps be in the recipe? GAH i meant creme de cacao! haha had a brain mix up!